Samsung Mobile announced the new Galaxy S8 and S8+ to the world on March 29, 2017. The highly anticipated twins add new functionalities that would improve overall travel experience. The South Korea based company moves forward away from the Galaxy Note 7 problems and introduces the brand’s first set of curved phones that have over a 83% screen-to-body ratio. The new phones are bigger in almost every dimension than the previous generation S7 and S7 Edge as shown in the table below. Eliminating the home button and overall bezel space allow the mobile manufacturer to improve the screen size by 0.7 inch. This increases the screen to body ratio from between 7.9 to 11.5%. Resolution is bumped up by 576,000 pixels to 1440 x 2960. Samsung will again use two types of the latest generation processors for the S8 series. The US model will use the Qualcomm MSM8998 Snapdragon 835 while the rest of the world will use Samsung’s Exynos 8895 Octa processors. Both will have have two slots for a nano SIM card and a micro-SD card up to 256Gb. The latter model’s second slot would also accept another SIM card. Performance gains are rated at up to 10% for processing and 21% for graphics. 4Gb of RAM and 64Gb of internal memory will be included in all models at launch. The one size fits all configuration does not add more RAMs in 2017 but doubles the base internal memory from 32Gb. 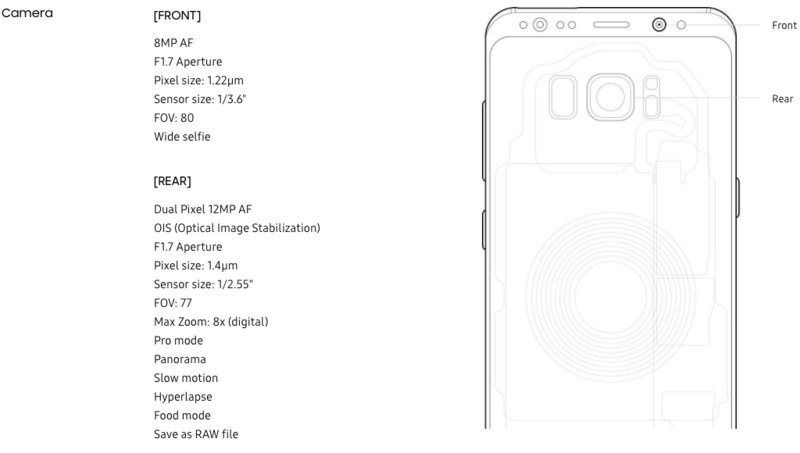 Samsung keeps the 12MP camera in the back with a 1.4µm pixel size (no change) and 1/2.55″ sensor size (increase by 0.05″). The front camera increases in resolution from 5 to 8MP. Pixel size goes to 1.22µm (down ~10%, higher is better) though sensor size improves to 1/3.6″ (up ~15%, higher is better). Battery capacity remains unchanged and non-removable between S7 and S8 at 3,000 mAh. The S8+ has a battery capacity reduction of 100mAh to 3,500mAh. – the first implementation of the Bluetooth 5.0 standard which helps the traveller get more information on items like airport security wait time that employ beacon technology to track passenger flow (e.g. John F. Kennedy International Airport). Refer to this post on use of beacon technology here. – the first implementation of Cat16 protocol capable of 1024 download/150 upload Mbps speeds. Dubbed 5G by some US mobile carriers, the speed increase can create a better streaming experience of high definition contents. Video calls may also improve in combination with the better spec front camera. – the brand’s first digital assistant named Bixby. It works by voice assisted commands for managing basic tasks (e.g. schedule meetings, get directions, etc). While this falls behind Apple’s Siri and Google Assistant at launch, Samsung can make significant strides with the 2016 acquisition of artificial intelligence start up, Viv Labs Inc. In the future, it is possible for travellers to use this assistant to book flights, make Uber arrangements or update hotel reservations. – authentication is completed using the iris scanner (front camera) or fingerprint scanner (moved to the back beside the camera lens). This gives travellers more ways to authenticate payments and tasks. – Android 7.0 Nougat installed by default which have better security protocols. Travellers have the ability to experience two mobile applications on screen concurrently (i.e. text and watch a video side by side). They also gain access better virtual reality options through the Samsung VR Gear. The curve part of the screen serves as a notification center for items like weather and meetings. It is unknown how the bigger screen size and higher resolution would impact battery life as their capacity did not improve. Travellers would gain better charging speeds to meet their top up needs during the day. The Galaxy S8 falls under the new US travel ban phone dimensions of 16cm x 9.3cm x 1.5cm (6.2in x 3.6in x 0.5in). 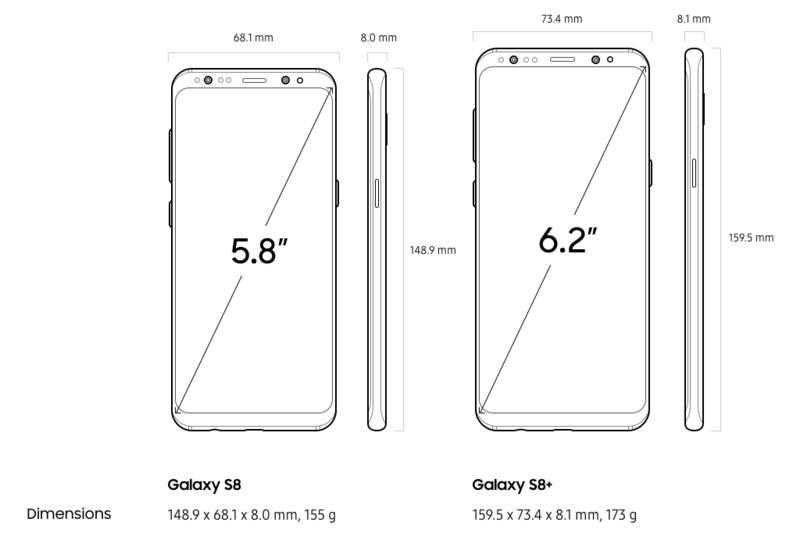 The S8+ is slightly lengthier but should be permissible based on total volume/size. Given the larger screen to body ratio, security agents may be confused to the true size of the phones at launch. The new Samsung Galaxy S8 and S8+ refines the previous generation. Travellers enjoy the latest technology with the larger screen size, Bluetooth 5.0 and Cat16 communication protocols. The only drawback may be battery life.